Barack Obama's birth and youth as a Muslim, a fact that he completely denies ("I've always been a Christian," "I have never been a Muslim"). Obama's networking with extremist Islamic groups, including the Nation of Islam and such organizations as the Council on American-Islamic Relations, the North American Islamic Trust, the Muslim Alliance in North America, and the Muslim American Society. Obama's indirect connection to Saddam Hussein via two corrupt Middle East businessmen living in the West, Nadhmi Auchi and Antoin S. "Tony" Rezko. Obama's ties to Ali Abunimah, the Palestinian extremist who praised Obama as "progressive, intelligent and charismatic" and as someone who "used to be very comfortable speaking up for and being associated with Palestinian rights and opposing the Israeli occupation." But, Abunimah bemoaned the fact that his once-state senator, on aspiring to higher office, cynically "learned to love Israel." Michelle Obama's Internet "friend" relationship with Hatem El-Hady, former chairman of "Kindhearts," an Islamic so-called charity shuttered for funding terrorism. Obama's friendship with Rashid Khalidi, the PLO official now teaching at Columbia University, as well as Obama's apparently vicious anti-Israel remarks at Khalidi's Chicago farewell party in 2003. 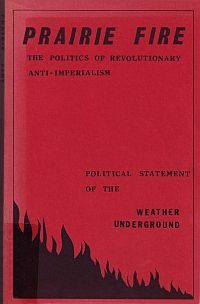 The cover of "Prairie Fire: The Politics of Revolutionary Anti-Imperialism," co-authored by William Ayers and dedicated to, among others, Sirhan Sirhan. In this context, yet another connection, documented at zombietime.com, may not come as a great surprise, but it nonetheless remains shocking: William Ayers, Obama's close associate at the Chicago Annenberg Challenge, dedicated the 1974 terrorist manifesto he co-authored, Prairie Fire: The Politics of Revolutionary Anti-Imperialism, to (among others) Sirhan Sirhan, Robert F. Kennedy's Jordanian assassin. (1) Other than Obama's lies about his childhood religion, which cast doubt about his character, all the other connections establish the radical circles he frequented during his Chicago years, associations he is trying hard – and with apparent success - to keep from the attention of just enough voters until after election day. (2) Andrew McCarthy points out that "This is not about guilt by association. The issue is not that Obama knows Klonsky … or Ayers … or Dohrn … or Wright … or Rashid Khalidi … The issue is that Obama promoted and collaborated with these anti-American radicals. The issue is that he shared their ideology."